This craft is so simple and satisfying. 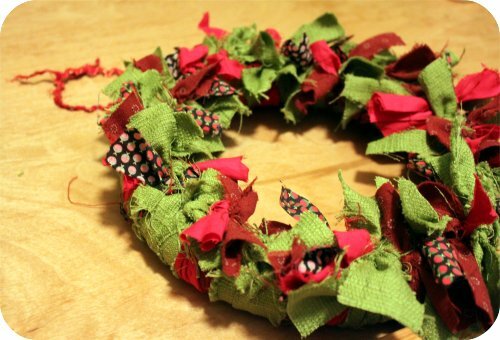 You recycle fabric scraps while creating a whimsical wreath. The beauty of this craft is embracing the imperfections. The more frazzled and textured, the better. 1) Use anything doughnut shaped for your base, I found my base at the dollar store. 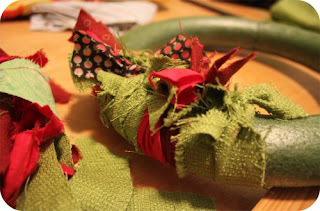 2) Rip your fabric scraps into even-ish length strips. 3) Then start to tie your strips into a knot around your base. 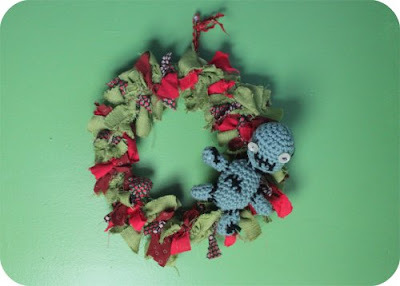 4) Keep going until the wreath looks full, like in the photo below. 5) Pin or glue on any embellishments, mine has an arugumi zombie. I use the same technique for my Halloween Rag Wreath (Check out that tutorial if you want more details on making these wreathes). These are so fun and easy to make, you'll be tempted to make one each room in your house. What're You Crafting for the Holidays? Share ideas in my silly holiday link share Show me Your Bush. I made one with leftover fabric scraps and added some felt roses. It is very easy and fun to do! I love the idea of a green and red one! Is that green burlap I see? love this! a great idea and I love the zombie on it! I really liked the Halloween wreath and this one is just as lovely, but the little monster really adds character. Jessica: make one, they are truly satisfying! TYRaines and Christine: Thank you! Glad others loved the not-so-Christmasy zombie. My Gram has a few of these she changes out seasonally. Maybe I'll try my hand at making one! Megan: They are so fun and easy to make! How cute - I really like the colors you used and the cute little "guy" you added to the wreath. I always hate throwing out fabric scraps so this is a great way to use them up! Pretty! Looks so easy to try.